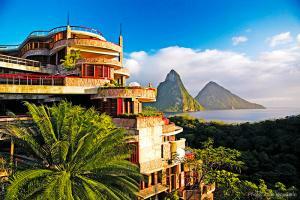 Jade Mountain is a cornucopia of organic architecture celebrating Saint Lucia’s stunning scenic beauty. Jade Mountain’s extraordinary infinity pool sanctuaries are open walled, stage-like settings from which to embrace the full glory of Saint Lucia’s dramatic landscape with views of the majestic Piton Mountains and the Caribbean Sea. Guests enjoy privileges at sister resort Anse Chastanet, a 600 acre estate with two beaches. With amenities like private butler service, Jade Mountain Club Restaurant, supplied by the Hotels own Emerald Farms to the two on site beaches, watersports, yoga, spa plus all the amenities, restaurants and bars of sister property, Anse Chastanet makes this Resort a mesmerizing experience. Overlooking the famed Saint Lucia Piton Mountains and Caribbean Sea, the property shares 600 acres with sister property Anse Chastanet. Located one hour drive from the airport or an easy 6 minute flight by helicopter to the Hotels private helipad. Rainforest, Botanical Gardens, Drive-In Volcano, Sulphur Springs.